Hi Crafty Friends!!! Welcome to the Easter Bunny Blog Hop! We are so excited that you are hopping with us today! If you came here by way of the Fabulously Crafty Julie then you are on the right track! If you landed here randomly and would like to join the Hop please start at the beginning at Cricut Cardz Challenge. Be sure you start there because Mary has some great Blog Candy to give away! For my Hop project I decided to make a magnetic Easter scene. I love crafting with my five year old Nephew so I knew I wanted to make a project that you could do with kids. I also wanted the project to be one that could be made in a short amount of time. I think little ones will love to help make this project as much as they love playing with it. My Nephew tested this out and loved it. He has since requested a red Easter Basket of his own. Please watch the video below to see my project in action! Chocolate Bunny for me! What about you? Here's my little nephew having fun! I hope you liked my project and get inspired to make some Easter crafts!! 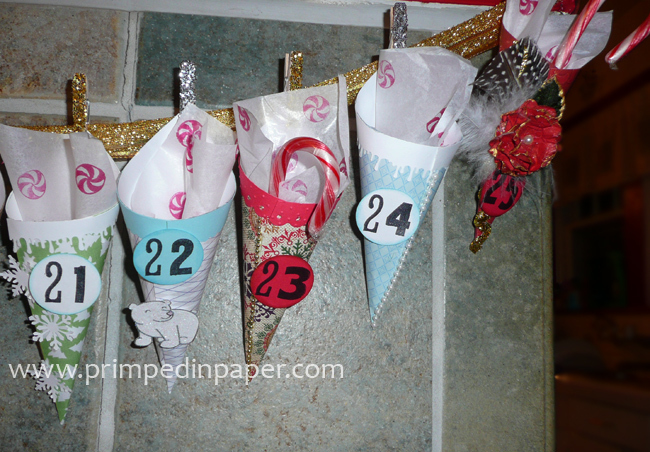 I would like to thank Mary & Jeri at Cricut Cardz Challenge for hosting this Awesomely Crafty Hop! Hugs to you both, we appreciate everything you do for the crafting community! Now before you hop to the next blog, I have some blog candy for one lucky hopper! For your chance to win just leave me a comment (comment button is at the top by the post title). If you’re not following me yet, I’d love for you to be a follower. It’s not required but if you like what you see on my blog then click the follow button! Comments close for blog candy at 11:59pm pst April 7, 2011. I’ll post the winner on the afternoon of April 8th. Winner will have one week to claim their prize before I pick another winner. So please come back and see if you’re the winner! Thank you so much and now I’ll send you on your way to check out Connie’s awesome project just click here! Hello Crafty Friends! Welcome to the Jingle-Jangle Blog Party! I just love sayin’ that! I hope you are all having a blast getting inspired by all the handmade ornaments! If you came here from Meredith’s blog then you are on the right track. If you get lost along the way or came here by chance please start at the beginning over at Gale’s blog. There are 14 super creative and awesome ladies to visit so you won’t want to miss a single stop! 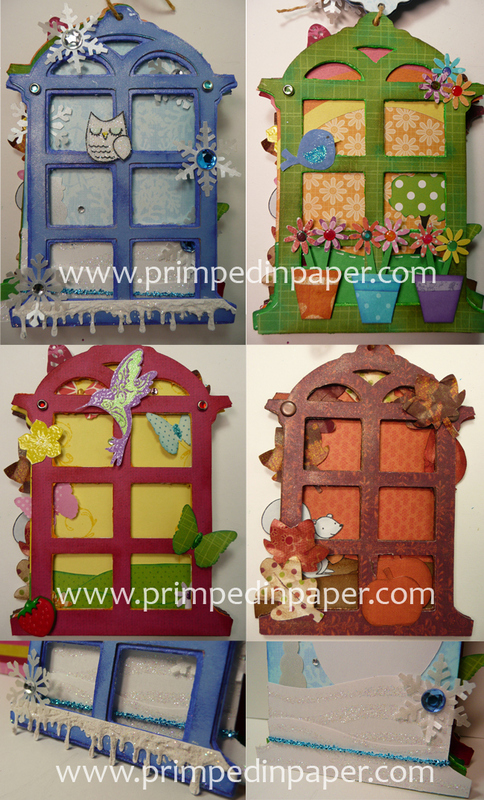 Today’s Blog Hop is hosted by the wonderful and talented Gale The Happy Stamper!!! Thank you so much Gale for inviting me to be part of this Hop! 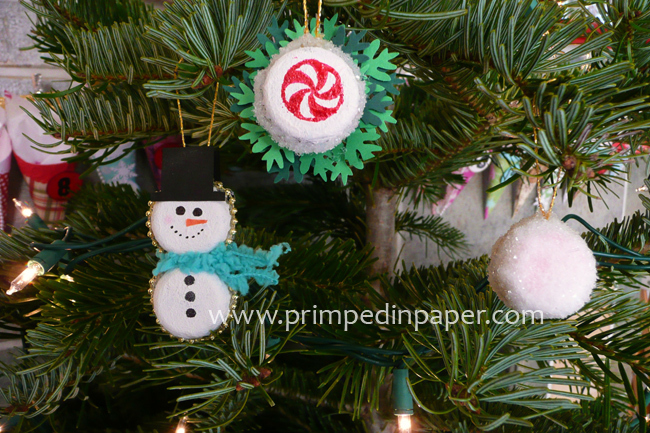 I had a lot of fun making my ornaments and can’t wait to teach all of you how to make them! For my project I decided that I needed to do something with the container of bottle caps that I had been collecting. (Thank you to my boyfriend and brother for saving these for me and trying their best not to dent them). 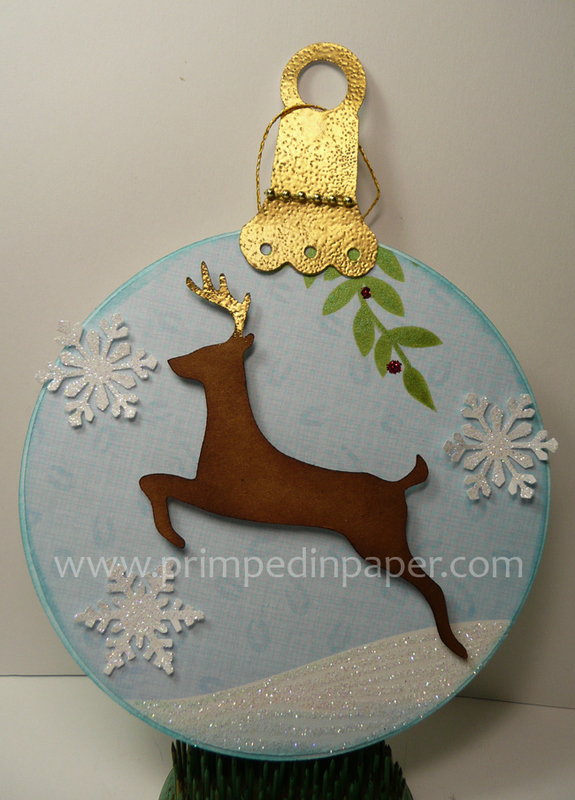 In the video below I will show you how I made three ornaments! It’s a fun creative project for kids and adults of all ages. Plus it’s the perfect project to keep kids busy during Winter Break. The video goes by kinda quick so be ready to push pause. 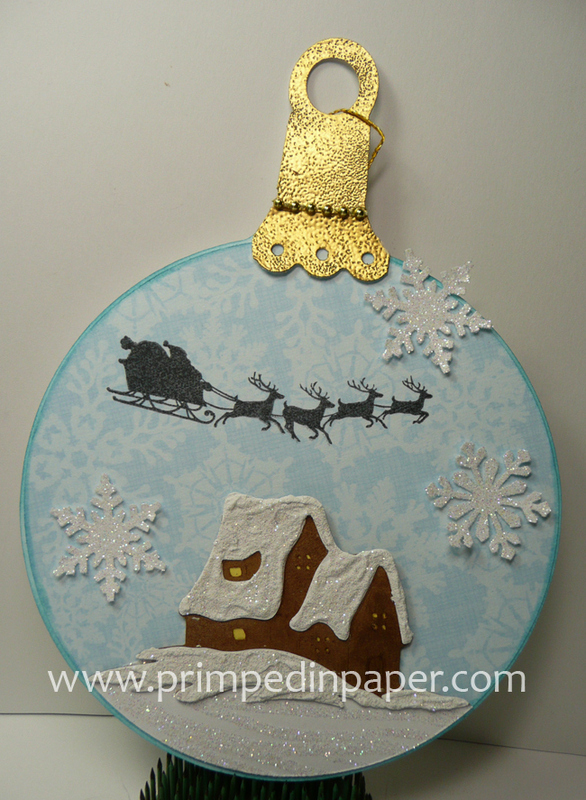 I hope you liked my ornaments and give this project a try. Now it’s time for Blog Candy!!! 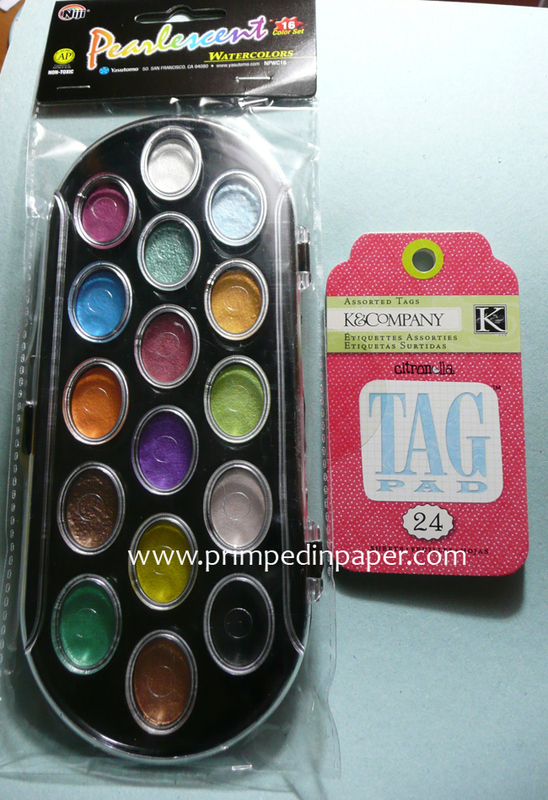 I have a set of Pearlescent watercolors and a K & Company Citronella assorted tag set. To win just leave me a comment! I will leave the comments open through Monday December 20 and will post my winner on Tuesday. Your next stop is the talented Raven! I know she an awesome ornament for you! Just click the link below to be taken to her blog. Bye! 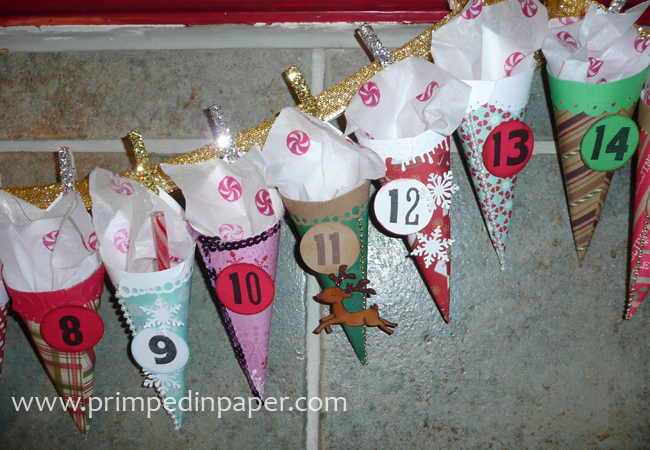 Hello and welcome to the Advent Calendar Blog Hop!!! I’m so happy that you are hopping with us. First things first, if you came here from Michelle’s blog then you are in the right spot. If you landed here by chance and want to play along or need to get back to the beginning of the hop, please start here at Angelica’s blog. If this is your first time to primpedinpaper.com, I want to say welcome and I hope you find my blog inspiring. Let’s get started! I’m thrilled to be part of another Hop hosted by the sweet and talented Ruthie. This Hop includes 16 awesome ladies. 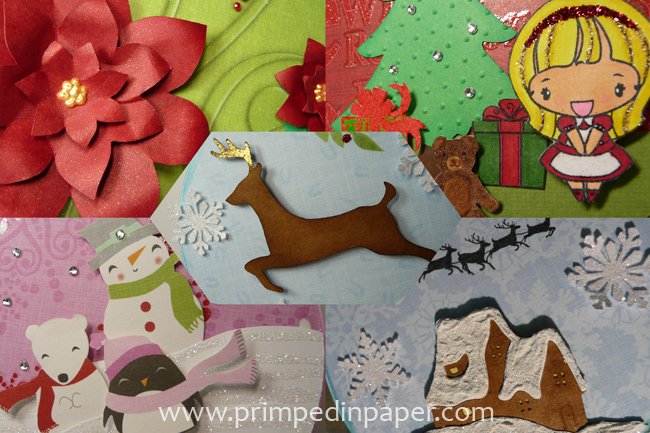 I’m excited to be included in this group of talented paper crafters. Thank you Ruthie for hosting another amazing Hop! This is my first time making an Advent Calender so I was really looking forward to this project. I decided to challenge myself to not use my Cricut. 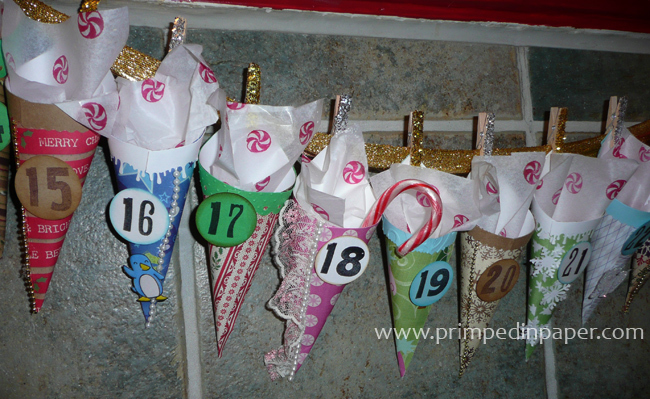 I wanted this Advent Calendar to be something that anyone could put together with minimal supplies. So I got out my Christmas patterned paper stacks, punches, strands of beads, glitter, one very cute set of Lawn Fawn stamps and my hot glue gun. Then I went to town! Click photo’s to see a bigger picture. Each cone is made from a 5x5 piece of patterned paper. The tissue paper is hand stamped with a peppermint stamp from Sassafras. The cute animals are from the Lawn Fawn, Critters in the Snow stamp set. I decided to use my circle punch since almost everyone has one in their craft supplies. 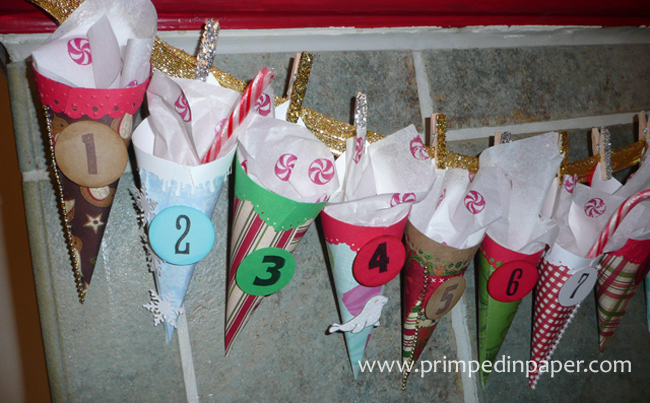 The cones are hung with clothes pins that I glittered. The red flower on cone 25 was made by my good friend Susan (suziecrafter). I hope you liked my Advent Calender. It was a lot of fun to make and I think it looks very festive hanging on my fireplace. Now I just need to get some goodies to put inside the cones. At the bottom of the post I listed the products I used to embellish my Calendar. Whether you keep it simple or embellish it to max, I think it will look amazing. The most important things to me are that all ages can help make it, you don’t need a lot of supplies and of course that you have fun! Thank you so much for hopping with us today! Before I send you off to your next stop. I have some Blog Candy!!! I apologize for not have a photo of it. But the Blog Candy is a collection of holiday stamped images (which I can stamp in your choice of Black StazOn or Tuxedo Black Memento ink, 20 5×5 sheets of Christmas patterned papers, fibers and some other goodies. If you would like to be eligible to win all you have to do is leave me a comment. Comments for the blog candy will close at 11:59pm pst Monday Nov. 29. I’ll post the winner on Tuesday afternoon. Now it’s time for you to head on over to Raven’s blog. I know she’s got an awesome Advent Calendar for you! Just click the button below and you’ll be taken to her blog. If I have left out anything that you would like to know about or if you have any questions, please ask. Be sure to leave a way for me to get back to you. Thank you so much! Hello! I would like to start this post off by thanking everyone for hopping with us over the weekend. It was so much fun. There was a lot of inspiration and creativity in everyone’s Mini’s. Thanks Mary for hosting such a fun Hop! Thank you so much for all the sweet comments and thank you for following me through NetworkedBlogs. I really appreciate everyone’s kind words and support. It really means a lot to me. I’m so happy to inspire others and share my love of paper crafting. 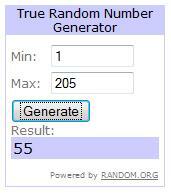 Random.org has a winner for us and that winner is………..
Congrats Celeste!!! Thank you so much for your sweet comment. Please email me your mailing address at primpedinpaper@gmail.com and I will get your prize out to you! Hi, and welcome to the So Many Mini Albums Blog Hop! I hope you are all having fun and getting lots of inspiration! There are twelve crafty and talented ladies in this Hop. So be sure not to miss a single one. A BIG thank you to our Hop Hostess Mary, for putting together this awesome Hop! I was very excited when Mary asked me to join this Blog Hop. We love you Mary! If you arrived here from Raven’s blog, then you are in the right spot. If you came here by chance or need to get back to the beginning of the Hop, click here to be taken to Mary’s blog. We are so happy that you are hopping with us today! I’m really excited to share with you my first Mini Album! I have named this Mini, Favorite of the Season. This Mini measures 5 x 3.5 and will hold my favorite photo from each of the four Seasons. I made the base of the Mini with my Cricut and cereal boxes. Below is a video of my Mini and information on how I made it. So who here like’s Blog Candy?? Ok, good. Here’s some Blog Candy for one lucky commenter. I’ll be throwing in a few other items too. To be eligible to win this set of Pearlescent Watercolors just leave me comment! You have until Sunday Nov. 14 at 11:59pm pst to enter. I will post the winner on Monday. Also if you would like to follow my blog through the NetworkedBlogs link in the sidebar, that would make my day! Thank you again for hoppin’ with us today! Now it’s time for you to hop on over to Jenni’s blog! 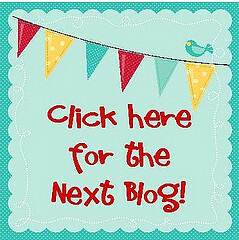 Welcome to Ruthie’s Banner Blog Hop! I know all of you are having a blast and getting inspired this morning. This Hop has so many super talented and creative ladies in it. Thank you to our Hop hostess Ruthie for hosting another fun Hop! If this is your first time to my blog, I want to say hello and I hope you’ll enjoy your stay. If you have landed here by way of MoMo’s blog you are in the right place. If you get lost along the way or came across this post by chance, please click here to start at the beginning of the Hop. Ok, let’s get started! I’m very excited to share with you my Christmas 2010 Banner! This is the first banner I have ever made. I really love how this turned out and think it makes a really cute decoration piece. 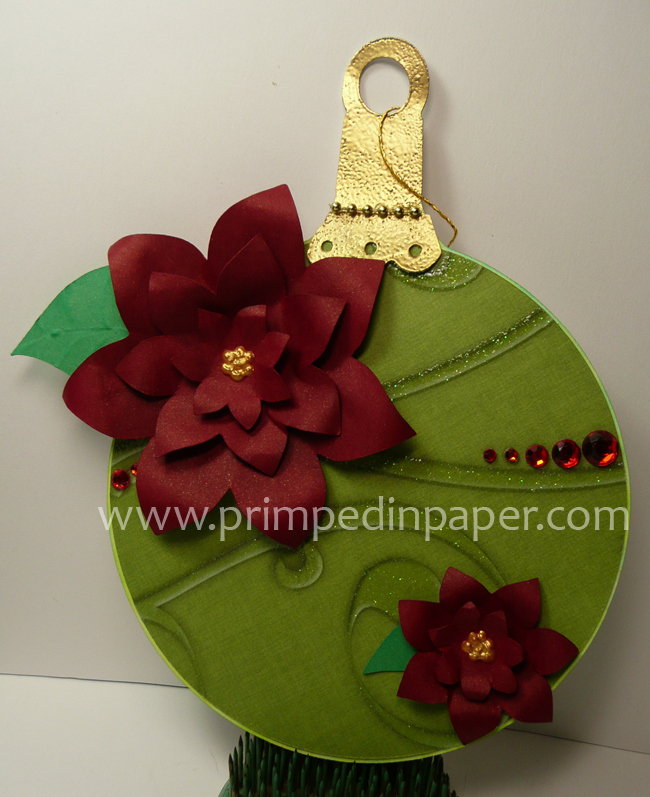 Each banner piece was cut into the shape of a Christmas ornament and hung with gold cord onto gold ribbon. I decided to have each ornament represent a Christmas theme or scene instead of spelling out a word. I thought this was a fun twist on the traditional banner. Here's a closer look at each of the ornaments. Thank you very much for hopping with all of us today! Before I send you onto your next stop, I have some Blog Candy!!! I’d like to giveaway a set of Pearlescent watercolors. For your chance to win, just leave me a comment telling me which ornament on my banner is your favorite! Winner will be posted on Monday November 8th. As for me, I like something from each of them but I especially love the little animals and snowman all bundled up in the snow. So now it’s time for you to hop on over to the sweet and talented Sarah! Just click the button below and you’ll be taken to her blog. Thanks again for hoppin’, have a wonderful day! Go Ducks! Any Oregon Duck fans out there today? ?